If we lived in Ames, we’d see coal trains every day. The Iowa State University Power Plant has operated since the late 1880s. Constructed in 1906-1909 and expanded several times, it uses 155,000 tons of coal from Illinois and Kentucky each year. Does mention of the ISU Power Plant ring a bell? Go to Louise’s 2010 posts on the plant, read her explanations, and look at Mother’s watercolor as well as the various photos (current and historic) of the plant. Notice the large 1920s coal stockpile. Our first house on the farm had a coal room connected to the basement. I don’t recall anyone delivering coal or shoveling coal into the furnace. By the early 1950s, a large oil tank in the east room of the basement supplied the fuel for our furnace. I was only three when we moved to the farm in 1945 and don’t remember if we always had the oil tank or if we used coal for a while. Hal remembers a coal room in the basement of his Sioux Falls house. Coal was periodically delivered and deposited into the room from a ground level opening next to the driveway. Hal’s father shoveled coal directly into the furnace and later into a stoker that carried the coal into the furnace. One not-so-fun task was cleaning the clinkers out of the furnace and dumping them into a metal tub to be carried outdoors, where they were picked up by the garbage haulers. In his book, Three to the Hill, John Wiegman listed the coal room as one of six rooms in the basement of the Rolfe house in which he grew up; however, he did not mention using coal. I’ve asked friends what they remember about coal. Several remember coal rooms but don’t remember using coal. 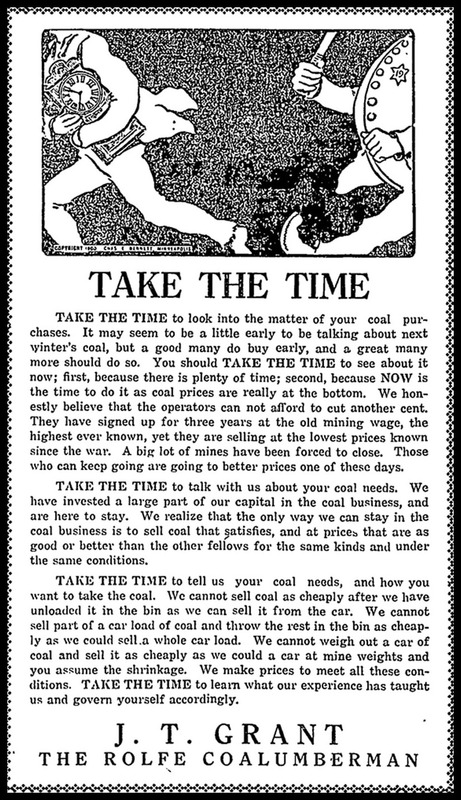 I’d like to hear from readers who remember having coal delivered and shoveling coal into the furnace—at home, in businesses or even at school. A list of sources consulted for this three-part series about coal is here. This entry was posted on April 28, 2012 at 9:04 am and is filed under Iowa. You can follow any responses to this entry through the RSS 2.0 feed. You can skip to the end and leave a response. Pinging is currently not allowed. Clara, I remember using coal to heat our house by the bus barn. We had some kind of heating stove in the living room that heated the whole house. We burned coal in it. As an aside, when my sister, Dianna, was born, I was almost 5. My dad took me to work with him that day. He worked for J T Grant then. I remember playing in their stagecoach, & getting a ride on one of the horses that pulled it. After that I guess nobody was watching me very well, because I got into the coal somehow, & I was black from head to toe. I remember my dad taking me home to Grandma Spiker, & her cleaning me up. We didn’t have a bathroom yet, so it must have been quite a chore. I remember the Grants as lovely people. Patti, what a wonderful glimpse into coal and Rolfe history you have given me, all via Clara having the idea for her “Rolfe-personal” and history-oriented series about coal. I’m a sponge for this kind of stuff. You and Clara are not that much older than I am, but in those years between you and me, I think coal became used much less. Thank you for helping me visualize. We had a coal furnace when we first moved to Manning (1957). I remember the coal being delivered down a chute from the truck. And I also remember falling on the clinkers in the driveway and skinning my knees! My grandma in Davenport shoveled coal into her furnace from her coal room when I was young. Later it was converted to natural gas. And our house in East Lansing (when we moved in 1985) had an old coal room, but it was clean and filled with wood for the fireplace. Patti and Jeff: What fun to read what you remember about coal in your houses! And, Patti, I can well imagine you playing in the coal wagon and getting covered head to toe with coal dust. In the basement of our old house was a narrow passage way in the south wall that went to a round room. It must have been used to store coal at one time, but I don’t remember ever shoveling coal into the furnace. All I remember was a large oil tank in the other basement room. My dentist e-mailed me with his recollections of how coal was delivered and used in his house in Omaha when he was growing up. I hope he’ll post his comments here, too. His mother grew up near Madrid, Iowa. Six cold-cold-snowy-cold months of coal famine. I’m not sure I can even relate. All so fascinating. Daddy would have been a freshman at ISU in 1936. And I *did* think of the coal plant there and Mother’s painting! Fun to hear, too, your memories, Clara, and Hal’s, too. As a child I lived at 4513 Burdette Street, here in Omaha. We had a coal furnace in the center of a dirt floor basement. 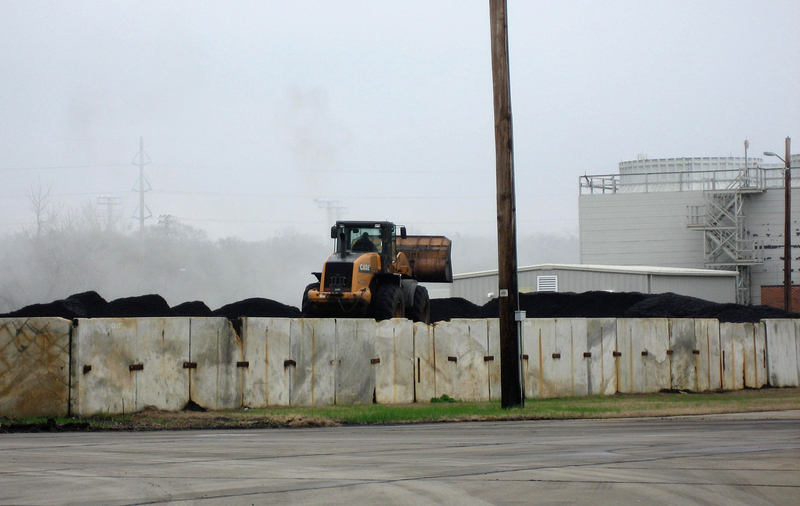 The coal was delivered by a soot covered man in rolled up bib overalls. The outside entrance to the coal room was a heavy iron flap that was hinged from the top and secured by a latch from inside the coal room. The delivery man shoveled coal down a metal shoot right onto the coal room floor. When needed my dad shoveled coal into the furnace for the home heating. My dad was a traveling salesman, so when he was out on the road, my mother shoveled the coal for us. My mother was a sturdy Scandinavian girl from a farm five miles north of Madrid, Iowa. You remember her when she worked as my receptionist until she resigned prior to her 90 th birthday. In the spring, when the furnace was no longer needed, the cinders and trash were shoveled out, and dumped in the alley to fill the winter ruts made by garbage trucks. The garbage trucks subsequently crushed and refilled the ruts. In our neighborhood it was a known fact that hollyhocks can only grow in an alley. Burdette Street science indicates that cinders and trash make the necessary poor growing substance that makes hollyhocks thrive. Judging from the minimal amount of flowers and foliage in our yard, the whole yard probably consisted of cinder-infused substrate. Clara, such an interesting article, and interesting follow up comments by all. I cannot imagine people’s lives who had no coal during the winter “famine.” Was the Rolfe School fueled by coal?